Like Bobby Murcer, Rudy May had two tours of duty with the Yankees that lucklessly came just before and just after the team’s 1977 and 1978 World Series triumphs. This perplexing card signals Rudy May’s initial arrival in New York, though it actually came out after he’d already played half a season for the Yankees. The fact that he’d already appeared in games with the Yankees, wearing a real Yankee uniform and a real Yankee cap, makes it difficult to understand why Topps had to resort to what may be the poorest bit of card doctoring I’ve ever seen. The uniform shirt looks like a piece of college-ruled notebook paper that sat out in the Topps parking lot all through a snowy winter and sun-drenched spring, and the interlocking NY on the cap appears to have been rendered by a distracted gorilla brandishing a tube of Crest toothpaste. The N in particular seems to have a sordid, malodorous life all its own, the part of the letter on our left like the staggering in-buckling leg of a drunkard, the letter-ending flourish on the right like the drunkard’s wilted flowers, offered in an ill-fated attempt to gain reentry to the apartment of his beleaguered erstwhile mate who hurled him out onto the street after ten or twelve too many booze-related fuckups. On first glance the pagan rune gracing Rudy’s cap appears to resemble some hastily etched symbol of pan-fascist resistance…one can imagine it perhaps scrawled on alleyway walls up and down the Iberian peninsula as some crude form of graffitied agitprop back in the 1930s. A more reliable anecdote about Rudy had a family friend’s son, a few years my senior, waiting with friends outside the Yankee Stadium players’ entrance at some point in the early ’80s. After fruitless hours spent enduring neglect from various Jay Howells and Jerry Mumphreys passing their way, a cherry-red Bentley (if the embellished tale is to be believed) pulled up to the gate. Emerging resplendent in full-on chartreuse velour-suited pimp-garb, replete with cape and wolf’s-head-knobbed cane, (aviator glasses be damned), Sir Rudy May rose from the vehicle, stepped up my family friend’s son’s friend’s friend, acknowledged him with a good ol’ vintage thumbs-interlocked “soul shake,” and strode regally into the Yankees clubhouse. Where he was no doubt attended to lovingly by a number of scantily-clad vixen-like starlets, and Art Fowler. In retrospect, though it is many years later, I see no reason to doubt even a single element of this story. Ah, yes. Ramblin Pete’s well-painted portrait of Rudy May has been delighting select audiences for years. When I first heard his description of Superfly Rudy May, I was surprised, since I’d always assumed him to be a shy, studious type, no doubt because of the glasses. 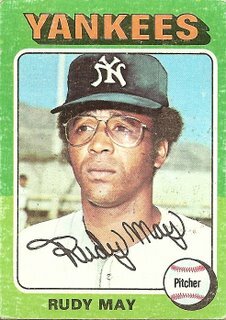 One other note: check out the lids over Rudy May’s eyes in this card. Good lord, it must have taken almost all his strength to fend off naps, leaving him exhausted and vulnerable to surrendering the tape-measure shot. That might be the worst example of Topps hat doctoring — to that point. The 1977 set noted the arrival of the Toronto Blue Jays and their complicated logo, which must have sent the Topps artists right over the edge! But the worst-ever example I have ever come across was on a Hostess Twinkees card of Rusty Staub, which has a painted on Mets logo, several random pinstripes and the Expos logo still on his chest. It’s so bad that I cherish it! I was gonna mention the aviator specs but Pete Millerman beat me to it. I’ll mention them anyways. My favorite painting on a baseball card was Mike Paxton. He was a very devout guy and there’s a theory that he didn’t want to be photographed for religious reasons. I was always fascinated by the retouched cards and their unholy interaction with reality. They always bore the faint whiff of embalming fluid to me – so clearly fake, like grandma in the casket. I had no idea Arthur Ashe played baseball.